Jerry Malcolm of rural Stronghurst, took "The Quill" to Port Arthur, Texas in late February. 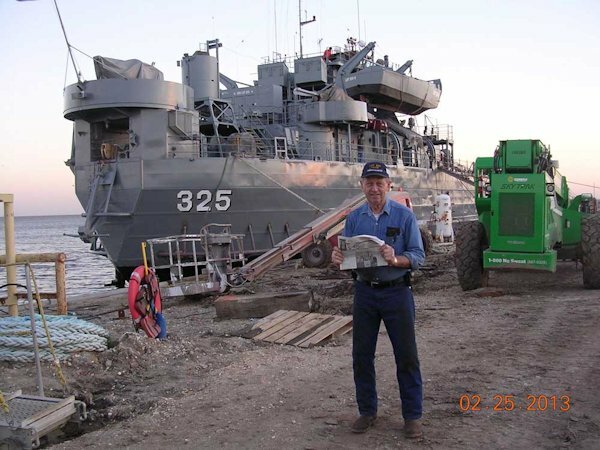 In early January he helped crew a World War II LST to Port Arthur, Texas for dry dock. In late February he went back down to help bring the ship back to her home port in Evansville, Indiana. An LST (Landing Ship Tank) is a flat bottom ocean going ship, 325 feet long 50 foot wide, capable of pushing onto a beach, dropping ramp and unload on the beach. The tank deck will hold 22 sherman tanks or other large vehicles such as 2 1/2 ton trucks and bulldozers. The top deck will carry smaller vehicles and cargo. He arrived back in Evansville, Indiana on March 9th.